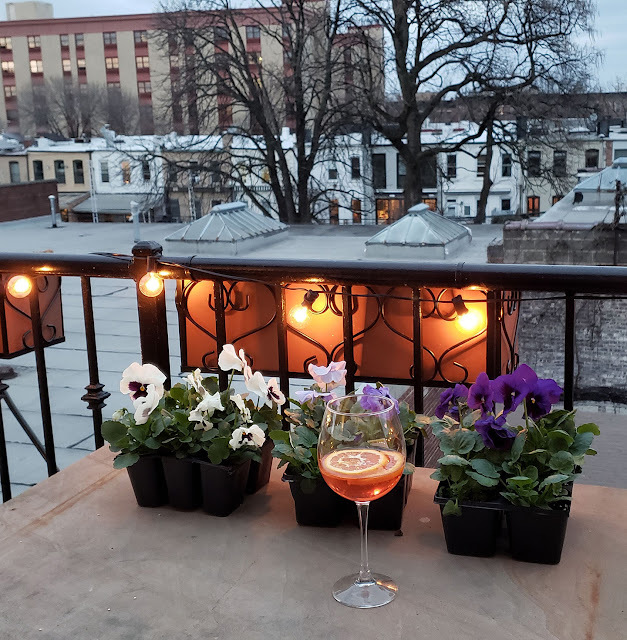 On a freakily warm evening we sat outside for the first time since last year, and drank Aperol Spritzers. The day was warm enough for short sleeves. The night bearable with light sweaters. We braaied later (lamb sausages from our local butcher), and watched a line of thunderstorms shatter the western horizon over Jersey. Above us, stars. Today, the cold is back. But the last week has been so sunny and hopeful that I impulse-bought pansies. This happens every year. Only when they are home do I check how many nights in the forecast are well beneath freezing. Answer: a few. Pansies survive serious cold, of course, but it seems unfair to transfer them straight from their greenhouse life to a bitter terrace. So mine are waiting a little, and will be brought in on those bitter nights. But seeing them makes me feel better. Every time we move I have learned something new about gardening. This time it's windowboxes. And to that end I have visited big box stores. For weeks I scoured the Internet and smaller local stores for affordable and attractive window boxes to increase the planting area, but not the clutter, on our new 110 square foot terrace (bear in mind I must leave space for the currently overwintering citrus trees, curry leaf tree, cardamon and galangals). But affordable-and-attractive is a rare combination, apparently, and my search yielded nothing inoffensive for under $100. For the eight-ish boxes I needed that was just crazy; over the years I have sunk untold thousands into gardens we have rented and left. And then one day, hunting African violets, I spotted $30 windowboxes at Lowe's. So I bought them. The windowboxes are just 24 inches long (I'd have preferred longer), but wide and deep enough to grow good herbs, salads and annuals. The black wrought iron decided me - it suits our iron railings. The thick coir matting lining will be reinforced with a layer of landscape fabric to prevent soil from working its way through the coir as it ages. The metal brackets that are supposed to attach the boxes are designed for angular wooden deck railings, not round iron. So I have substituted lowly but practical, heavy-duty black zip ties - very strong, and mercifully invisible against the black railings. 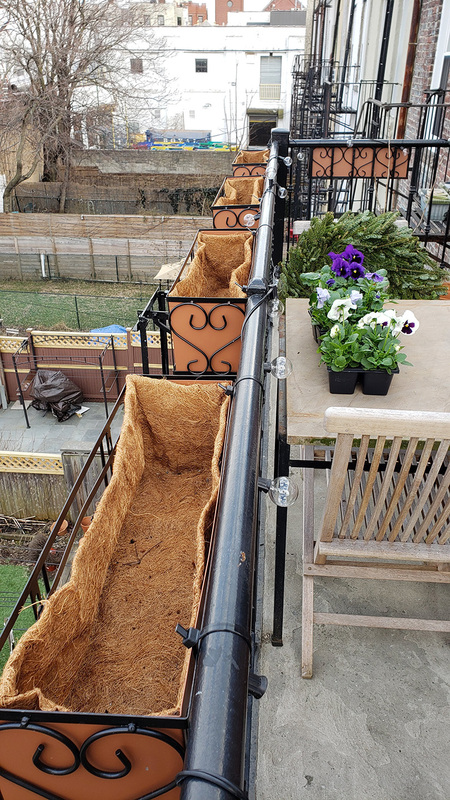 Safety is important with any planter hanging over a void (although the fire escape would catch them), so I am using three zips per planter. 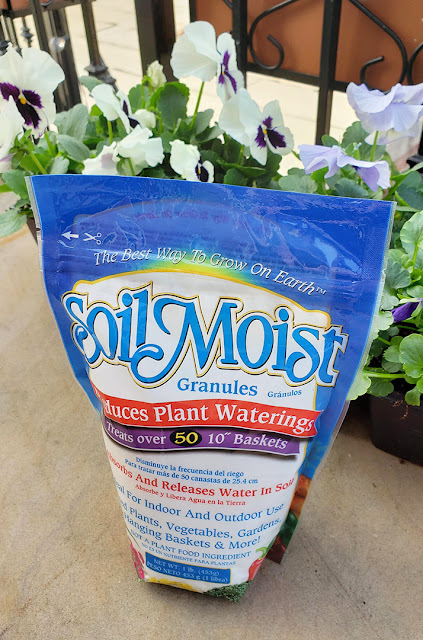 And I am using Soilmoist for the first time in my own pots (it's an old professional gardeners' trick); also harder to find than it should be. It will be mixed with potting to soil to increase moisture-retention in the planters. Smaller planters dry out faster. In an effort to attract hungry migrating birds I slathered several park pinecones with peanut butter and nice bird seed. No birds, yet. 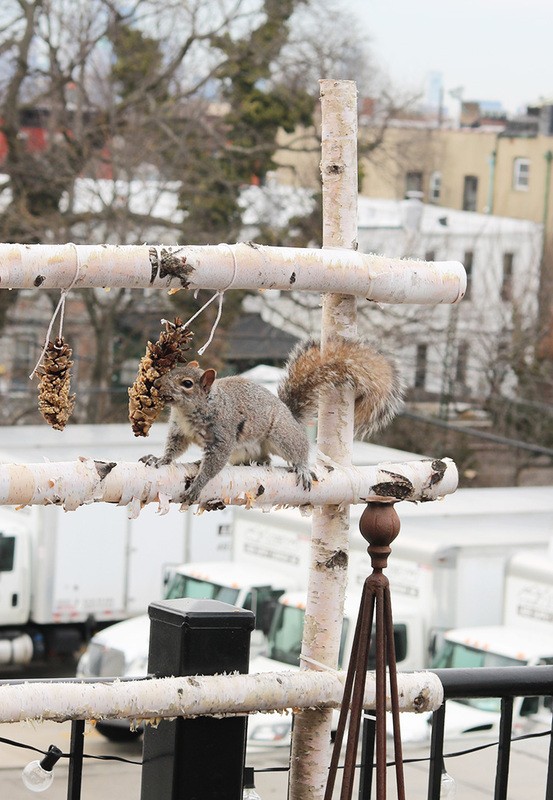 But squirrel. He's already left some warm Yelp reviews for me. Not the clientele I was hoping for. But all things considered, life could be worse. And is, for so many. Funny, looking at this terrace. It seems so tiny after your last two -- and yet, it is no smaller than your first (although then you had the roof for other pots). At any rate, past experience assures me that you will make this incredible. Very interested to follow, and you're off to a good start. :) You are inspiring. LOL! 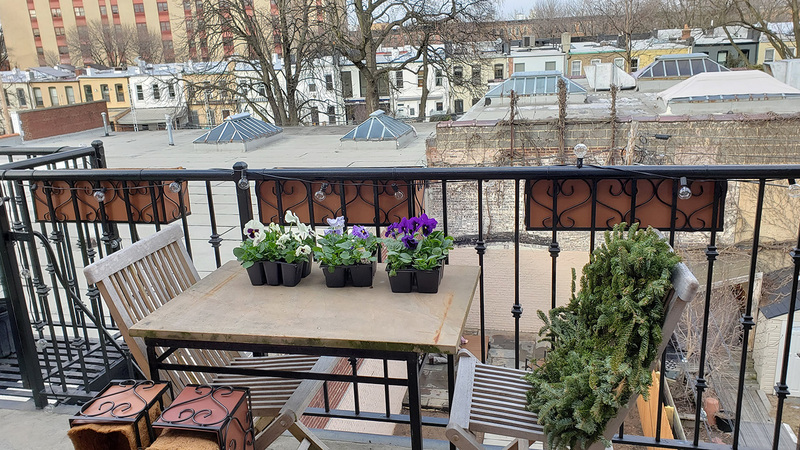 the sidelong shot of your terrace shows all your boxes waiting patiently for their beautiful treasures but the background is noticeably bare of past pots waiting to receive their Spring treasures. No doubt , it will not be long before the irresistible gardening urge takes root and all those terraces will be filled to capacity with green treasures. Enjoy! Thank you. Background terraces as in neighbor's backyards? Ah, spring is about to, well, spring! I can just see you standing at the ready to get those pansies out as soon as the night temperatures are above freezing. We went to 29 last night with heavy frost this morning, so we are still a week or two away from safe, but my list is growing and i will soon join you in dashing out to dig. Meanwhile, i'm working on building projects. Erosion is mandating that i create a terrace and a dry creek to slow down the water that runs down our side yard. (Two years of heavy rainfall have caused too much damage to ignore any longer.) It's a challenge, but interesting ... and a great way to spend the warming afternoons while the ground is still too cold (and wet!) to work. Can't wait to see what you do with the new terrace! Big project, Win - but it does sound interesting. I filled my planters with potting soil, today - cold fingers! Love the pictures! Could you tell me where you find your birch poles? Hi Lily - thank you! I bought them online from Wilson Evergreens. Ahhhh I don't know how I missed this post! I am clearly not the only person anxious to see how you transform that terrace. I had a feeling window boxes would be part of the plan!